There's a new accessory trend in town, and while I think girls from all over the globe will enjoy it, it's especially convenient for those who hail from none other than the Big Apple. If you haven't already guessed from the above photo, the trend is black patent leather—and let me tell you why. Seeing as it's more durable than both regular leather and suede (for starters, a few raindrops won't mean the end of you), the black patent leather shoe and bag craze seems as if it was made for the weather, walking, all-around hustle and bustle of New York City life—not to mention how good it looks. As one of several extensions of this season's overarching matrix-inspired, futuristic, trend, these sleek patent pieces can be used both to complement an all-black, already-edgy ensemble or to make an otherwise-simple look, well, shine. No matter which way you go with the styling this season though, the bags and shoes you're about to see below will be pieces I personally think you'll want to keep forever. 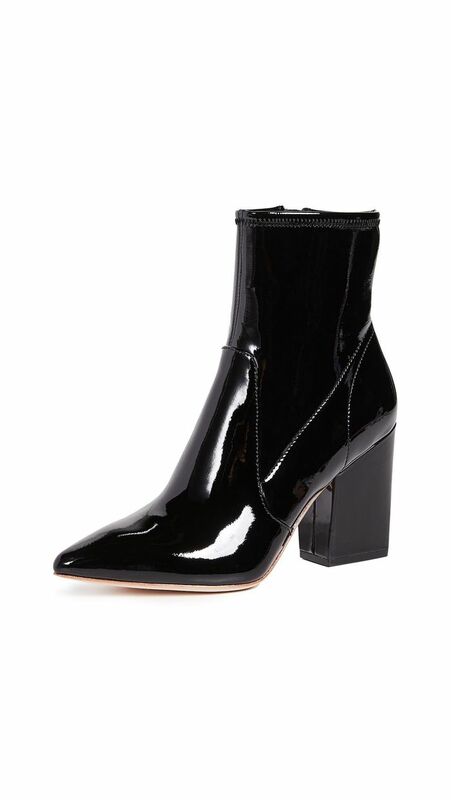 With everyone from Saint Laurent to, of course, Zara endorsing the trend, it has the makings of a keeper. Without further ado, shop my black patent shoe and bag picks below. These will be your new everyday shoes this season. By Far is the accessory brand everyone is wearing right now. I'm obsessed with these bent heels. The classic Hayward shopper is, of course, cool in patent. Can't possibly go wrong with Manolo slingbacks. You heard it here first: the duffle seems to be making a comeback. Tackle two trends in once with this studded, Western-inspired pair. Just mini enough to wear from day to night. Another perfect pair to wear with your jeans this season. This might be my favorite bag of the bunch. True story: These are in my cart currently. If you really want to go for the matrix trend, opt for these. This square toe just feels so fresh. Fall mules with a trend-forward spin. A little fabric goes a long way to make something stand out. I love this metal heel. The belt bag is the trend that keeps on giving. These are totally fall-appropriate if you live in LA. Anything Tibi is a go. A little logo never hurt nobody. Wear this to work all season long. These give you a little extra height while still keeping it casual. Up next? The shoe trend I personally own five pairs of right now.